And so August began, and a new sketchbook was opened. I bought a softcover Stillman and Birn Alpha landscape book from the UC Davis bookstore – I do like that paper a lot, and the softcover is slightly smaller than the hardcover making panoramas a little faster – more on those later. However it is a bit more difficult to hold in the way that I hold my sketchbooks, trying to keep them flat and sturdy, but it’s not impossible. The dark red cover is very nice. 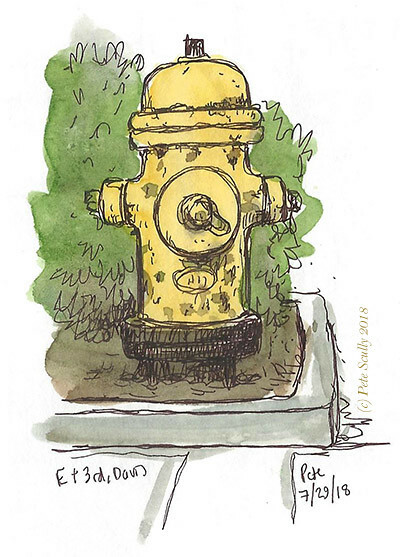 It was the first day of August, my sketching muscles were twitching, the weather was unbearably hot, my inbox was overflowing. 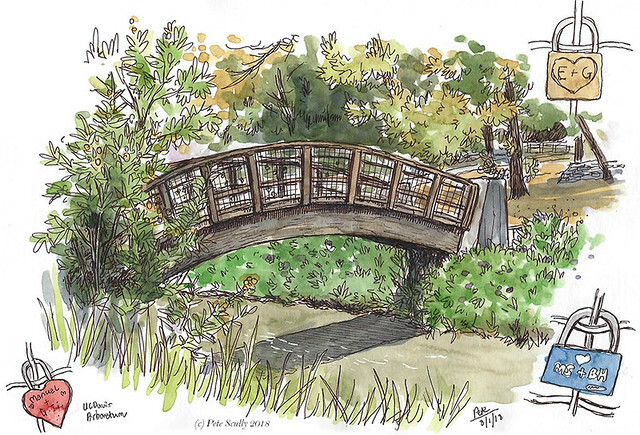 On this particular lunchtime I took myself into the Arboretum and sketched one of the bridges over Putah Creek. This one has a lot of those padlocks attached to it. You know the ones, like on that bridge in Paris, the one which got so overrun with these ‘love-locks’ that they were worried the weight would drag the bridge into the Seine and they were removed. There are a few such love-locked bridges in the Arboretum. So if you are unfamiliar with the concept, what people do is they carve their initials or their names into a padlock, and then attach it to a bridge, so that they can come back some day and say, oh look it’s still there, amazingly. Or they can come back with a future girlfriend/boyfriend and say, “no, that isn’t me, that’s another person with the same name/initial.” Or, more plausibly, they can come back with a future boyfriend/girlfriend and say, “yah, this was probably me, I don’t remember, this one too, and this one, you don’t know them, they went to a different UC” to which the boyfriend/girlfriend can roll their eyes and say “yeah right, you put these here yourself”. You get the picture. And now for the final part of our recent trip to Europe. I was determined that we’d visit a historic castle, something we don’t have many of here in California (sorry Mr Hearst, Mr Disney, but those ain’t castles). So we hit the motorway (thanks to my mum for driving us) up to Warwick, in central England. I had been there a few years ago, and knew it was a pretty great sight. 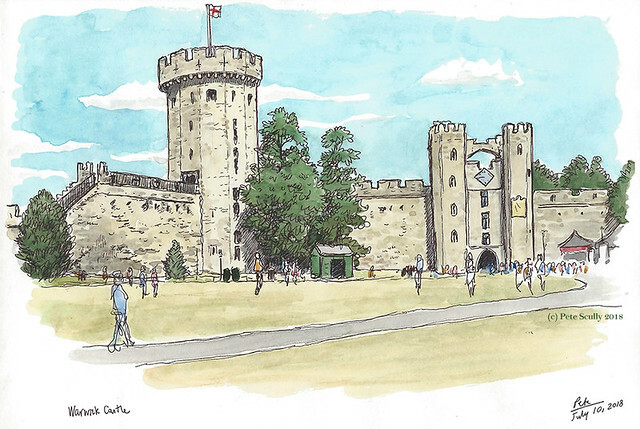 Warwick Castle is a little theme-y (being owned by Merlin Entertainment now) but as it has a Horrible Histories maze and some fun jousting entertainment that doesn’t matter. Actually, we missed the jousting as it’s not every day (though I did see some four years ago, and it was fun). 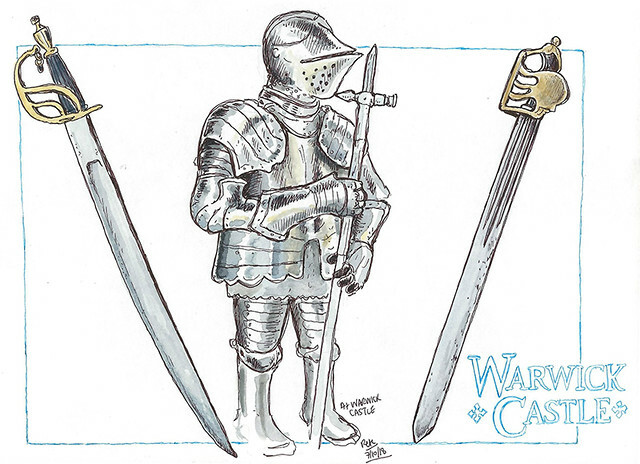 Warwick Castle is in a beautiful location on the banks of the Avon river, and a historically significant geopolitical spot, being in the middle of the country and therefore an important stronghold for the balance of power. The Earl of Warwick in the late middle ages was known as the ‘Kingmaker’, not without exaggeration. The site of Warwick Castle was founded as a ‘burh’ by the formidable Anglo-Saxon lady Æthelflæd, ruler of Mercia (also ‘Ethelfelda’). She fought against the invading Danes and the Welsh, she was also a daughter of Alfred the Great, and in fact there was a re-enactment of her funeral in June 2018 in nearby Gloucester. When William the Conqueror invaded in 1066, the Normans built a motte-and-bailey castle here on ‘Ethelfleda’s Mound’, and Warwick Castle was subsequently built up over the next few centuries by later lords and earls. The first Earl of Warwick was Henry de Beaumont, from 1088, and the 16th Earl, Richard Neville (who gained the title through marriage to Anne de Beauchamp) was the famed Warwick the Kingmaker, who rose to prominence during the Wars of the Roses before dying at the Battle of Barnet in 1471. There’s a lot more history too, but I was interested in the old armoury. The suit of armour below is actually a child’s armour, likely for ornamental purposes. I sketched the castle above while taking a break with my son, who didn’t want to walk around the dungeons. We didn’t stay in Warwick, though I’d love to sketch that old city some day. 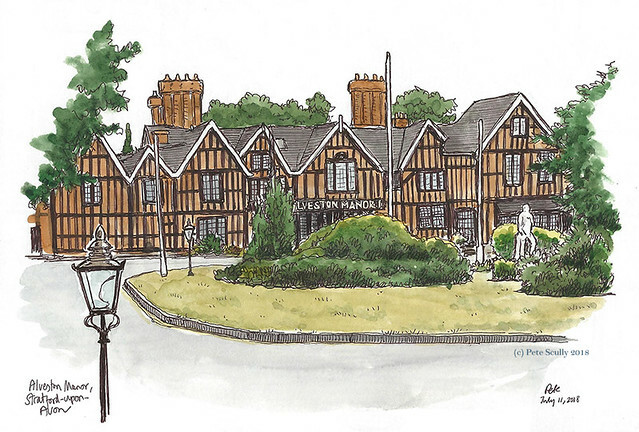 Instead, we stayed the night in Stratford upon Avon at a place called Alveston Manor, a large country house converted into a hotel just a short walk from central Stratford. It was lovely, and I love drawing buildings like that. Stratford is Shakespeare’s town, and they do not ever let you forget it here. We did walk up to see Shakespeare’s birthplace, and walk along the Avon, and I had a huge knickerbocker glory (with extra chocolate) at a local pub. So good. In the evening after watching France knock Belgium out of the World Cup, I walked down to the riverside as the last mid-summer light faded away, and sketched the bridge below. This was around 9:30pm at night. I decided to walk across the other bridge to get back to the hotel, whcih was a mistake. It was a logn bridge along a road with a fairly narrow path for pedestrians, and lots of cobwebs. During the day the cobwebs were quaint. In the evening they were covered with thousands of busy, chubby spiders, loving their little legs and spinning and completely freaking me out. They weren’t dangerous, unlike the ones in my Davis back yard right now, but so many of them moving all around me was pretty much the creepiest thing ever. I ran as quickly as I could, but it was a long bridge. Yeah, I’m not into spiders. Another panorama intended for colouring in but ultimately left as is, due to running our of time. This is the last one for London, then I have another post from elsewhere in England, and then it’s Davis all the way. It was the day of the England v Croatia semi-final in the World Cup. 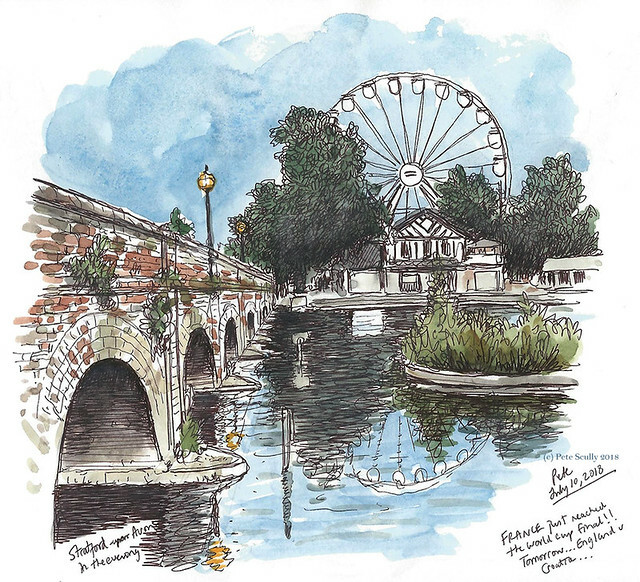 The evening before we were in Stratford-upon-Avon, watching France eliminate Belgium, and when we got back to London I took the tube down to central London for some last minute sketching and shopping, ahead of our trip to the Iberian Peninsula. This is Seven Dials, which is a junction of seven narrow streets located between Shaftesbury Avenue and Covent Garden. It’s one of my favourite spots in London, being right by the London Graphic Centre (where I stopped by for some replacement paint half-pans). That’s one of my favourite shops in London. The other is just around the corner, Stanfords, the cartographers and travel book store. I love a map. Ironically I get lost quite often. I think I see maps like art, beautiful objects of winder and magic that I just can’t understand nor explain. I always get there in the end, even if takes a long time. Seven Dials in London reminds of Seven Dials in Brighton (aka London-by-the-Sea), where in the early hours of one New Years Day a couple of decades ago I got terribly lost trying to find my way back to the indistinguishable house I was supposed to be looking for where my companions were staying. Brighton I thought is an easier place to navigate because there are only three directions – North, East and West, with South just being The English Channel. Haha, you foolish boy. I could not remember the name of the street I was supposed to be on, just that it was one of the ones going off of Seven Dials. Hours of walking around each of the ‘Dials’. I did have a mobile phone (this was 2000, well 2001 by that point) but it didn’t work very well and I may have been out of pay-as-you-go credit. I found it eventually, and forever have an amusing Brighton anecdote to tell. But back to Brighton-by-the-Land (David Devant reference), I stood here sketching a panorama as people walked by, many heading to the pub to start drinking ahead of cheering on England. A lot of people, I noticed, were wearing yellow clothes. Yellows skirts, trousers, shirts, the occasional hat. I don’t think this signified anything, and certainly has nothing to do with the football. Perhaps yellow is ‘in’ this year. I don’t know fashion, but once thing I do remember about living in London, people would say, “oh green is ‘in’ this year,” or similar. “Brown is the new Black.” Football shirt fashion I understand, but real clothes, well I just wear navy blue and black mostly. Anyway I did notice this trend of wearing yellow, but I didn’t add anyone to my sketch in a yellow blouse or anything, so forget I mentioned it. The only colour I added, well you can see for yourself. The Union flag stands out. England were in the semi-final, and while it’s been a few decades since this was the flag waved at England games, it still seemed nice to include it. I went home to watch the game with my family. England lost to Croatia. That’s that, then. 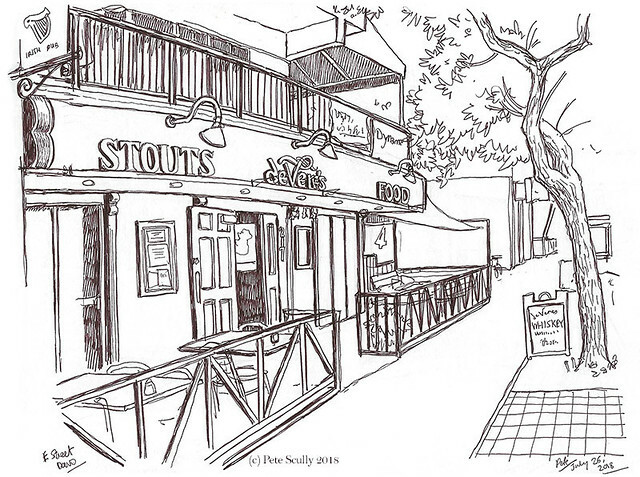 By the way, you might be interested in seeing the last such sketch I did in this neighbourhood, four years ago at the end of Monmouth Street, looking toward Seven Dials, below. 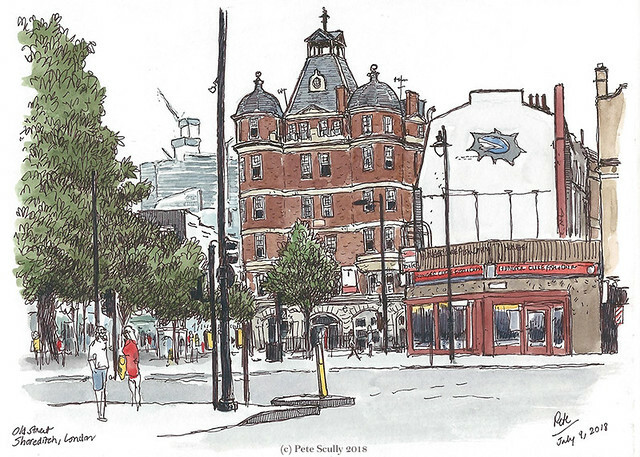 This is one of my favourite sketches I have done of London. 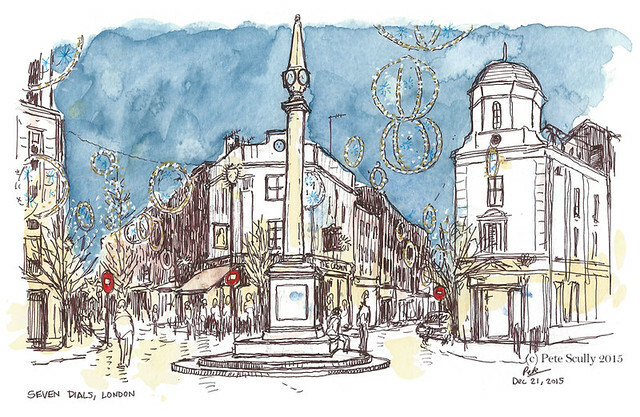 Ok and one more for luck, this is a sketch of Seven Dials I did a few years ago around Christmas-time. At least in this one you can see the top of the coloumn. London can be beautiful sometimes. London, early July. It was so sweaty. Air-conditioning is a thing that happens to other people. This was, I was often told, a heatwave to rival the one that happened in the year I was born. That summer was legendary, a long mid-70s sun-fest. I was too young to complain about it then but I’m sure I gave it a good old go non-verbally. I’m not a hot weather animal, which makes it all the more surprising that I now live in the California Central Valley, which has Really Hot Summers. “Dry Heat”. Not so much in humid London. While the temperature is lower than back in Davis, London summers can be unbearable. Specifically, London summers when you have to use the tube, especially when it’s packed, which is often. We went down into central London to go to the British Museum. I figured, it will be nice and cool in there, among all the marble. What we got was a ridiculously sweaty British Museum with no air-conditioning, with a large greenhouse in the middle. I tried to do some sketching in the Greek rooms but was sweating too much. Eventually we left, got back on the sticky tube, and went over to Old Street to find a very special store. I’ll tell you about that in a minute. Above, I managed to sketch this scene of Shoreditch High Street. It was hot and sticky but it was mostly overcast, so at least there was no baking sunlight. In the background, new buildings going up in the City. London is changing, always changing. 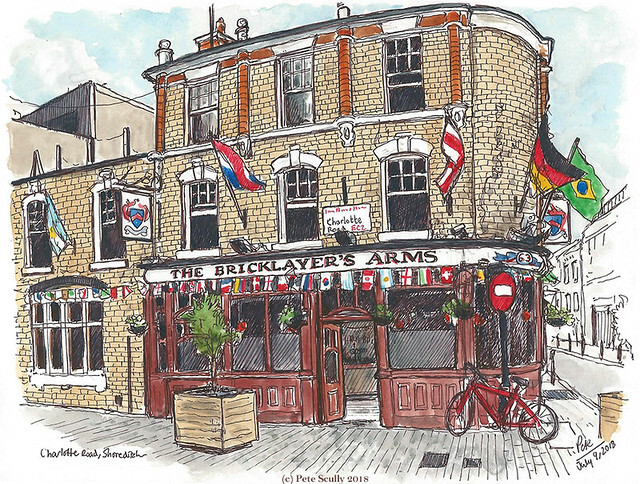 This is nearby, the Bricklayers Arms. I’d wanted to sketch an old pub, old pubs are becoming a little rarer each time I return (at least the ones that remain get a little older each time I come back too, if you think about it). I’d never been here before. I never really went out around Old Street and Shoreditch before, except a couple of times years ago. I wasn’t really Cool enough for this part of town. That was my excuse. I really liked sketching this – colourful flags, and lots of bricks. After I was finished with the sketch I popped in for a pint before heading home. But before I did this…further down the street was (during July only) the pop-up store of Classic Football Shirts. This was on the back of an exhibition of old football shirts called ‘Fabric of Football’ which had taken place in London this year.Now if you know me you know that I am obsessed with two things: fire hydrants, and football shirts. Ok I’m obsessed with old languages, travel, Formula One, noodles on toast, Marvel comics, Star Wars, Tottenham, and obviously drawing, but if you’ve ever followed my Twitter feed during football tournaments or any other time you’ll know I’m in love with those colourful uniforms. I pretend I know all about things like tactics and player fitness, but I’m usually just saying words I’ve read in a Jonathan Wilson book to sound clever. With football shirts though I feel like I do at least Know My Stuff. So it was a pleasure beyond pleasure to come here and browse through the old shirts, mostly the ones from the 1990s, such as that great Nigerian shirt from the 1994 World Cup (never mind the 2018 one, the home and away from 94 were the real classics). I was also pleased to find they had the very shirt I was wearing (1993-95 Spurs home shirt) on display outside the store. I got a few compliments at various times on this trip for this shirt, by the way. The 1990s kits have made a comeback in a big way (still amazed all my 90s shirts still fit, actually…). Anyway this place was a highlight of the trip! Check out their website at: https://www.classicfootballshirts.co.uk/. I didn’t buy myself anything (all the things I wanted were a little bit expensive) but I did get my son an AS Roma shirt from 2016. After the Spain and Portugal sketches, I’ll step back a few more weeks to the England part of the trip, for this post at least. 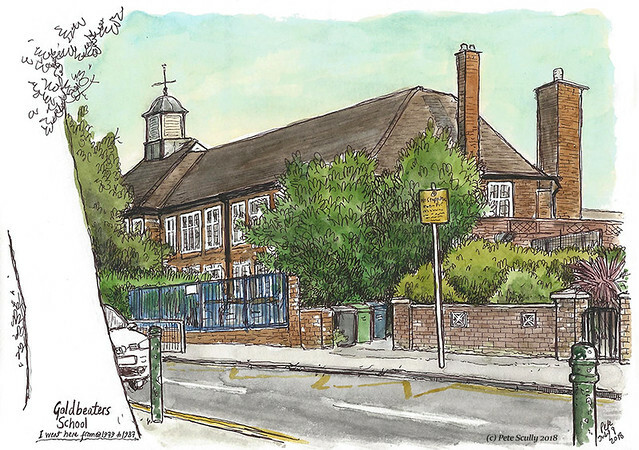 This is Goldbeaters School in Burnt Oak, sketched early in the morning when I was awake with the jetlag and wanted to go for a little walk to see what had changed in my old home town. Burnt Oak, for those of you not familiar, is in the northern reaches of London, the second to last stop on the Edgware branch of the Northern Line, and it is is where I am from. Burnt Oak has changed a lot for sure but I’ll always be from there, and since my family still lives there I will keep going back. Another change this time, the Tesco on Burnt Oak Broadway has closed down. I really don’t know why they would do that (I really do, though: to build expensive flats). That was a shame, because it means now there is no Tesco in Burnt Oak, and Burnt Oak is where Tesco actually had its first store, in 1929. I will miss Tesco in Burnt Oak. I remember going shopping there with my mum as a little kid, she’d bump into her friend Lyn and they’d talk for half an hour, the Indian ladies on the checkout were always very nice to me, then we’d pop into the Stag next door to say hello to my nan, go into John Ford across the street to buy sewing materials, stopping by the greengrocers on the Watling to get five pound of of potatoes, to and I’d maybe get a Slush Puppy from ToniBells on the way home. Yeah I hated being dragged around shops as a kid actually, I just wanted to go to Vipins and look at pens and pencils. And don’t get me started on being dragged around shoe shops in Brent Cross, to this day I can’t spend more than a minute in a shoe shop without saying “are we done yet?”. Anyway enough childhood reminiscences. Well maybe some more. This is Goldbeaters School. Where is that name from? Much of Burnt Oak was built on the old Goldbeaters Farm, which goes back to the 14th Century. I attended Goldbeaters from the nursery (1979? ), through the infants (1980-83) and through the juniors (1983-1987), before going off to big school at Edgware. I loved Goldbeaters. I’m so glad it’s still there, looking not very different from the day I left, from the outside at least. My mum went there too, back when it was a secondary (‘senior’) school. My oldest friend Terry, who lives in Japan now, that’s where I met him (though we only swapped football stickers, we actually became friends after we both left for Edgware), and his mum also went there (not at the same time obviously). My next door neighbour Tasha went there, we would walk to school together, her mum would pick us up, we’d walk through the park and play on the swings on the way home. Years later her kids went there too, and she worked there. Yet none of my siblings went there, they went either to Barnfield School (next to Silkstream Park) or the Annunciation (same street as Goldbeaters, but that school is for Catholics, and I’m not a Catholic). My old Goldbeaters friends, I hold such affection for to this day, though I’ve not seen many of them since then: Ricky, Daniel, Lee Glenn, Carl, Wayne, Lee Fickling, Hartman, Duggan (who is sadly no longer with us). And many others. We were very international too, with families from all over the world, all backgrounds. My old teachers, Mr Winston, Mrs Baldwin, Ms Welsh. Ok, ok, we can all do this, draw a picture of the school we went to and remember our old teachers and friends, and that is always tedious to read. Ok then here’s a few more memories that pop up randomly about Goldbeaters from the 1980s. Those outside toilets which were just the worst, basically a metallic gutter behind a wall. Football stickers on the playground when someone would knock them in the air and shout ‘scramble’!! Buying those buttery biscuits for 2p at break-time. Singing “All Fings Brite and Byoootiful” in morning assembly. The noise in the lunch hall getting so bad that the dinner ladies would bang a massive metal spoon on the table and shout “SHUT-UP!! !” and it would go silent, for a few minutes. In fact that lunch hall (which was also the gym)…the terrible ‘mashed potato’ which was wide and powdery and tasteless, the peas which are actually the reason I don’t eat peas to this day, bringing a packed lunch of pork pie, yoghurt and sandwich and not being allowed to go out an play until I’d eaten up the whole pork pie, horrible jelly and all (I don’t eat pork today either, I’m seeing a pattern emerge). Mr Bunster attempting to teach us to sing “Little Donkey”. Kids vomiting on the playground, and instead of cleaning it up the school would cover up the sick with sand. Grazing your knee on the concrete playground and going to the medical office where Mrs Lyons or Mrs Eftychou would douse a piece of cotton wool with a stinging antiseptic and hold it against the wound. Carl Sanderson making us always play ‘Hammer House of Horror’ (I always wanted to play ‘Star Wars’). Getting to be the one who rang The Bell for Home Time. Being on the team that beat our local rivals Woodcroft School in the ‘Panda Competition’, a quiz organized by the local police. Winning a borough-wide pottery competition for a ceramic butterfly I made. Drawing, drawing, drawing all the time, being known as the kid who draws all the time and holds his pen in a funny way. I could go on, but I won’t. I’m surprised I remember so much. 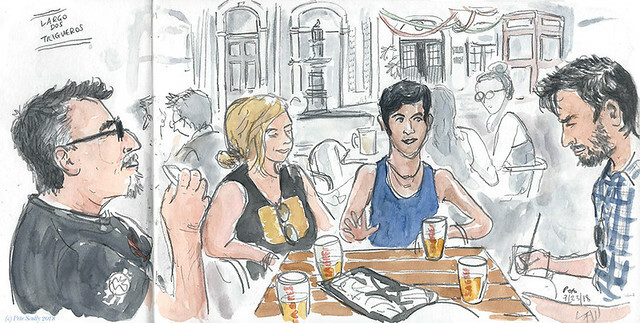 On my final night in Portugal, after a day of easy sketching and peaceful wandering, I met up with Lisbon-based sketchers Pedro Loureiro and Silvio Menendez, along with Genine Carvalehiro and her girlfriend Sara, at Rossio in the heart of town. The locals took us over to a place called Eduardino, (“Ginjinha Sem Rival”) which was a tiny little hole in the wall that serves little plastic glasses of a drink called ‘ginjinha’. Now I think I had seen Rick Steves drink a ginjinha maybe, but I had no idea what it was. It’s a Lisbon specialty, a cherry-based liqueur that people will often have on their way out somewhere, good for the health, and comes in two ways – “with” or “without”. That is, with a cherry or without a cherry. I had it with; it was delicious. 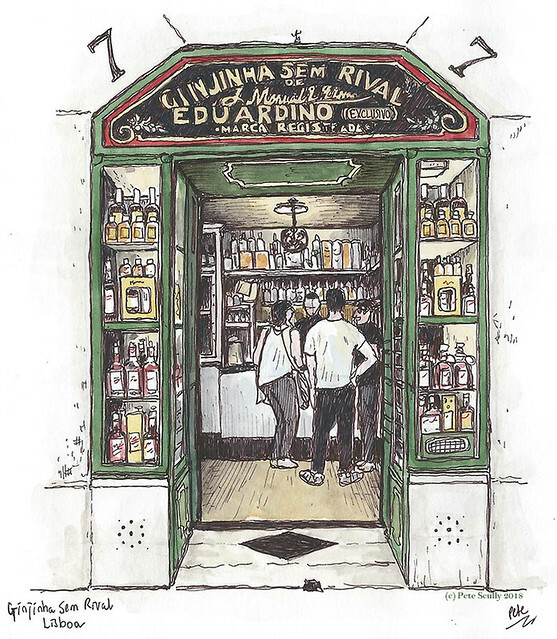 I drew the little ginjinha bar below, but not on site, I did this from a photo I took, as we were on our way out to explore another part of central Lisbon. We found a little café in a courtyard overlooking part of the city, and had some beers and cheeses. I sketched my very nice company, we talked about the various symposia we had been to (I had forgotten Genine also went to Lisbon 2011, she was in one of the workshops I took; such a long time ago now!). This was up at Largo dos Trigueras (above). After drinks we went looking for a place for dinner, and bumped into Matt Brehm, who was waiting for Liz Steel and Suhita Shirodkar, so we combined our urban sketching parties and went to a little traditional Lisbon restaurant for food and wine and more fun conversations. 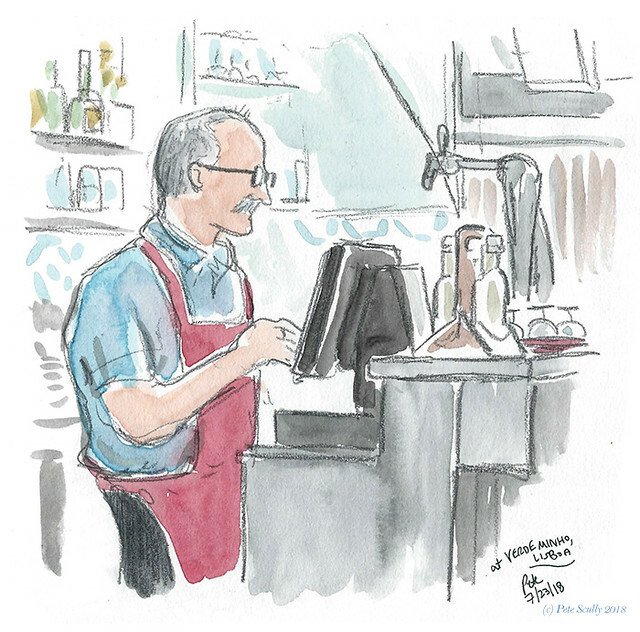 I sketched Matt (whose workshop called “the Light of Lisbon” I had taken in 2011 in that very neighbourhood), and also the restaurant owner who served us. We ate until late, talked past and future symposia, about how much Urban Sketchers has grown, about all the new people we’ve all met in that time. 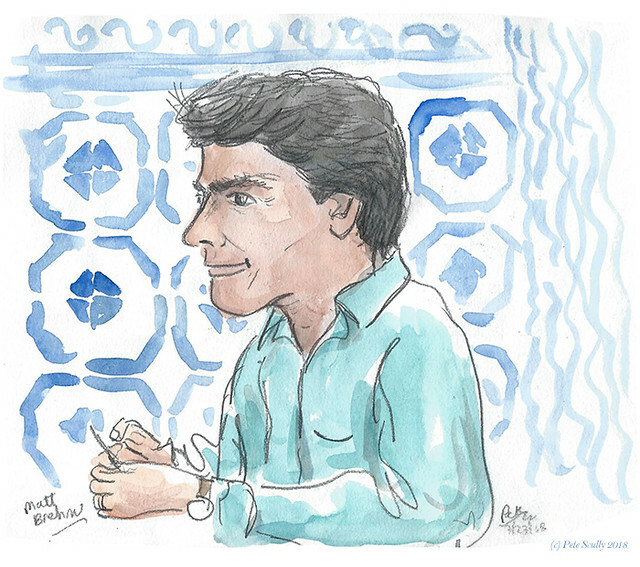 I must say, I have been a little bit of a reculse of late, as far as the sketching community goes – I didn’t even tell people I was going to Porto, just in case I couldn’t make it – so it was nice to catch up with old friends from around the world. Now next year, Amsterdam, I do need to promise myself that I will let other people know and actually try to make connections ahead of time; I might go first to Belgium and finally sketch with some of the Belge sketchers I know. Being social can actually be quite a good thing. Anyway we all said adeus and then I went back to the hotel, for I had an early start the next day. A cab to the airport, then a plane to Atlanta, and another plane to Sacramento. 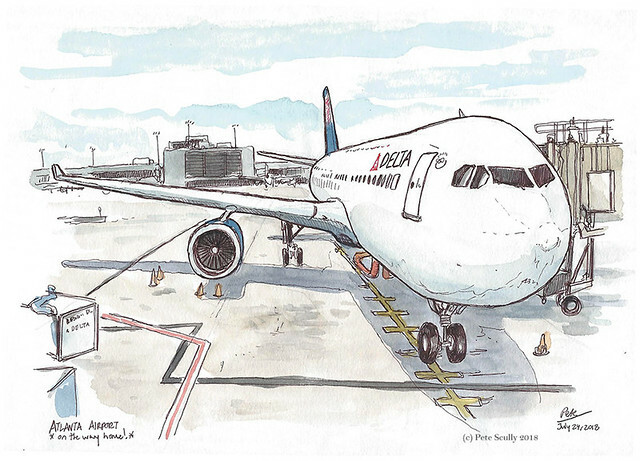 I sketched a plane at Atlanta airport while I had my layover. It was a long, long, long day, and I was exhausted. Three weeks away, and it takes more than getting over jetlag to recover. My mind itself was still over in Europe for at least a week or two afterwards. I think I just have permanent wanderlust. Until the next time!